SAP has been hosting an all-manufacturing event with customers for several years. These knowledge fests are designed to share knowledge between customers, as well as with SAP to provide the customers the latest plans and concepts as they drive their product portfolio forward. All major industry segments were covered—from CPG to industrial markets1—along with the many supporting functional process areas, from customer insights and analytics to suppliers and logistics. If you are a major manufacturing customer of SAP, I recommend you send a team, as some companies have.2 In this article, I’ll tackle some of the highlights and provide my perspective. You will hear more as we cover SAP in our various supply chain reports and articles. At the outset, I want to bring forward a provocative statement made by SAP’s Scott Bolick, Global Head for Idea to Performance Solutions, in his presentation Idea to Performance (which is a strategic direction moniker for SAP). He stated, “We are not just an applications company. We are a design and services company.” Having this knowledge upfront will help you to understand the content to follow. Why? Because SAP has a lot of capabilities. And many of these are components, tool sets, methodology, and knowledge. Unlike the SMB space which likes more turnkey applications, the SAP enterprise market has an appetite for blending components—within reason. Scott did admit that SAP knows they have a complexity challenge, and they are trying to deal with it. Having said that, there is enormous diversity in business models, needs, and opportunities for large manufacturers who have diverse needs. One-size-fits-all is just not for everybody. One of the most dynamic areas in the global economy is the CPG/Retail area. It is an area that is also experiencing a huge technology change. Today, many CPG manufacturers no longer rely solely on the retailer for insights about their markets and customers. Whether you do or don’t, the need for collaboration between your channels and your business is critical. SAP is tackling the thorny challenge of cross-supply-chain visibility with an array of applications, data, and analytics. From customer-level/shopper insights, demand sensing, and forecasting, to collaboration with suppliers, SAP is investing heavily to provide precision, in real-time, to increase understanding of dynamic market conditions and facilitate ongoing planning. This combination of technologies is designed for large-scale customer bases and large SKU count environments, as the CPG/Retail environments are. What is important about this is the ability to manage the data—not just receive feeds. So Master Data Management and the high-performance memory-resident HANA allow for highly accurate planning runs. The speed of HANA makes it very practical to do multiple scenarios and analyses. For many users of advanced planning applications in the market, the memory-resident architecture is not a new solution. But for many SAP users, it is. Thorny problems like pre-product or pre-promotional launch analysis that require high performance (i.e., big data), can be attacked. With the explosion of social data and analysis of social sentiment, the HANA platform is a real plus. I will come back to HANA later in this article. SAP has a multi-module approach for addressing the S&OP process. S&OP is a module that sits on top of other supply chain planning applications. We attended a workshop by Intrigo, a key partner of SAP, who has developed the knack of getting APO working, as well as developing many of their own complimentary solutions that integrate with SAP. SAP has developer partners who are certified to extend SAP. Intrigo has developed solutions for high tech and semiconductor companies. 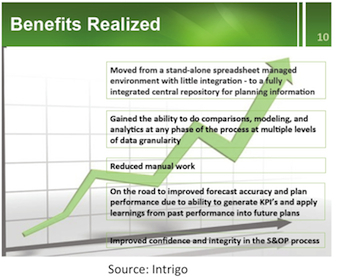 Intrigo’s presentation of a customer case on cloud-based S&OP, aptly named “…Getting Out of the Spread Sheet Jungle,” leveraged S&OP in the cloud and HANA to solve the customer’s problem. Cloud certainly represents a natural environment for S&OP, since it addresses multi-functional, multi-source, and multi-site challenges. Integration across various data sources is the key, since even in the most automated companies users arrive to the meeting with their own sets of data. This reliance on ‘my data’ and ‘my own spreadsheets’ is not a scalable approach for companies. (Read Six steps to get your S&OP in High Gear). Advanced approaches such as using scenario planning during a meeting to fuel the discussion is a very attractive capability that a memory-resident planning engine can easily provide. You can’t get that from the mess of spreadsheets—no automation, no standardization, no ability to collaborate. Intrigo described the many benefits their customers reported from using Intrigo’s solutions, but this jumped out at me: “Gained the ability to do comparisons, modeling, and analytics at any phase of the process at multiple levels of granularity,” as well as the ability to create a single repository for data and continue to work on models, etc. In addition, the process and data can be shared on mobile devices. This capability supports always-on-the-move professionals—from executives who want to see only the summary and decisions to the analysts who want the details. Real-time right now for the enterprise? Not quite. Currently, HANA is playing within the realm of custom projects. SAP showed a plethora of projects and use cases that they have done with customers. I imagine that ultimately, the redundancy of customer-requested requirements will help drive standardization here. Or one day we may wake up, and SAP will only be on HANA. But that is a ways off. The APO-focused audience of course wanted to know when—and if—SAP would just have supply chain planning on HANA, rather than requiring two separate purchases. Clearly that is under consideration within SAP. SAP has made HANA available on the cloud and for the SMB. This provides elasticity for smaller companies who have occasional analytic exercises or have large enough data sets to require the extra oomph (and can pay for it). All-enterprise in real-time has been talked about; and a few customers actually are running their whole ERP on HANA. But most customers see HANA as support for large data sets or complex analytics. 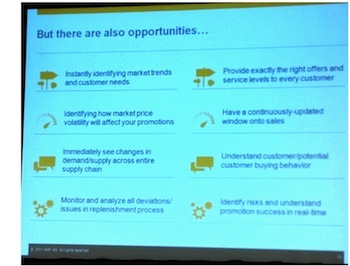 There is some great content on http://www.suiteonhana.com/cross-industry that addresses scenario planning with HANA. At the discussion about SAP’s analytics, Lumira was one of the more cogent sessions on analytics that I have sat through in a very long time. SAP’s analytics are focused on the end-user/business analyst, not the data scientist. So trying to make it easy (if analytics can be made easy) is a goal. They are on the attack in the analytics market against the TIBCO, Oracle, and SAS market. This is the component/best of breed market for analytics. Lumira can be bought in the on-line store—no salesperson required (unless you are buying a big corporate license and need to integrate it into other applications). SAP is leveraging the open source R language, and open source tools for algorithms, graphics, etc. to provide ease of use, integration, and portability. Going with predictive analytics is critical within manufacturing businesses, due to the need for sensing, for calibration and tuning of business processes, and for finding patterns in events. Predictive analytics supports people’s and systems’ learning process. Surely something we all need! As the US economy warms up, the manufacturing sector continues to improve. Aric Newhouse, NAM’s3 Senior VP of Policy and Government addressed the ‘caffeine-requiring’ morning audience. I would imagine it is hard to give a jaunty presentation when you have to deal with government policy all day. He did try. Beyond the obvious issues of legislation and could government really do that much for manufacturing, he outlined ways in which the government could help a bit through tweaks to taxation and immigration reform. He encouraged business people to actually visit their Congress members4 and educate their legislators about what manufacturing does and needs, and what they think Congress can do. An interesting book, I think, that any manufacturing or supply chain professional in the US would find insightful is, “Fate of the States: The New Geography of American Prosperity,” by Meredith Whitney.5 Especially in the mid-section of the country, states with little to no debt can be a part of the manufacturing solution, since they have the flexibility that a debt-ridden state does not, to offer incentives such as a low tax base to encourage relocation to their locale. There, “these companies will bounce back from the excesses of the downturn and see ‘decades of gains’ as the region rebounds,” Whitney says. We hope that is true. Ultimately, our progress is in our own hands, through innovation, talent acquisition and retention, leveraging technology to improve performance, and attending to our customers. To circle back to Scott Bolick, he said, “We are not selling traditional applications.” My take away is that is true—not just glib messaging. SAP is trying to tackle broad problems that are more inter-disciplinary/cross-functional in nature, especially in companies that are large multi-division companies that sell in complex markets. We will cover more of SAP’s supply chain capabilities within our supply chain reports on Demand Management, Transportation Management and Warehouse Management in the coming months. 2 Although some of the presentations are a repeat from Sapphire, most are not. Plus, if you ‘run’ on SAP, you need all the contact points and information you can get, especially now, with the platform changes, new technologies and new offerings.